History of the continent is something I'm woefully under educated in, and so I welcomed the chance to read Jennifer McVeigh's new book about the Kenyan revolution in the fifties. The book definitely proved to be a good read and timely, too. Of course, by saying it's timely, what I mean to acknowledge is that we can often draw from the historical in other situations and see ways it relates to our current situations. So even though this was a different time, with different countries involved, some of the mindsets and struggles still feel real to our struggles today. Rachel's mother died when she was twelve and her father sent her back to England to be raised by her grandparents. But Rachel misses Kenya and as soon as she graduates she heads back to the country. But in the six years she was gone things have changed and new tensions have emerged in the country. For the Europeans (namely English) still living there, the threat has expanded to involve them as a revolutionary group is rising in power. Meanwhile, things have also changed for Rachel's family. Her dad is living with a woman who has taken over the farm in many respects. She and Rachel don't get along right away, and that adds to the general unease in the story. The novel is also relatively quick paced even though it comes in around 400 pages. I was never bored but I had a lot to learn about the background and everything was fresh and new to me. 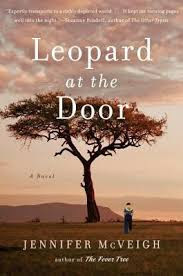 I enjoyed reading this book and being immersed in the world it offered. I did receive a review copy from the publisher.